Did I mention how cold New York was? It was so cold, even brass monkeys wore gloves. I don’t even get that. It was so cold, I had to open the fridge to warm my hands, no I said that one last time. It was so cold, I lost the ability to think of anything ever. There, that works. But it wasn’t too cold to sketch. I tell a lie, it definitely 100% was too cold to sketch, but for the sake of it, for the sake of urban sketching as a thing, I jolly well did it, because, well I’m not in New York every day. Sadly. This was done on the Saturday afternoon, the second coldest day of the trip (oh wow, the 14th was even colder, it was so cold that it made Frosty the Snowman look like the Human Torch, see I’m just not very good at these analogies and things, I don’t know if that’s really what I do. I would be terrible in one of those schoolyard “yo mama is so fat…” contests you always hear about, I would be like, “yeah, shuttup, you mug, stop being sizeist” or something. Anyway back to the sketch. Yes, I stood in the sub-sub-freezing-cold weather and sketched the scene above. In the goshdarned cold. Oh I was wrapped up warm, unbelievably warm. Multiple layers of clothing, two jackets, gloves, thick hat, thermal longjohns, two pairs of socks, look I’m not going to describe my whole wardrobe here (stripey underpants, ok?) but I was pretty warm. But that cold, man. Amazingly my uni-ball signo um-151 pen held up pretty well and did not let me down. I did all the inkwork except for about half the windows on the skyscraper (it’s the Chrysler Building for those of you who have not heard of New York before) and some of the windows on that other building in the background (I believe the phrase that I uttered when I got to that part was ‘sod that’), and then added the paint once I got inside somewhere warm (I went to an igloo on Pluto). This is Grand Central Station. Sorry, sorry, I meant Grand Central Terminus. What? ‘Terminal’? Right ok, it’s Grand Central Terminal. Only an out of town bumpkin like me would call it ‘Station’. In fact I think it’s one of those things whereby they go around telling people it’s ‘Station’ just so that when people repeat it to New Yorkers they can get laughed at. Actually I think none of this is true at all, this is in fact entirely a conversation I had in my head while sketching, in fact the imaginary conversation turned a bit ugly at one point and I had to break up the imaginary out-of-towner who was all, “you think you’re better than me, huh” and the imaginary New Yorker who had dropped his imaginary banter and moved straight into an imaginary aggressive “huh, wiseguy, huh, well things are gonna get real ‘terminal’ for you soon buddy”, and well I just left them to it frankly, this completely imaginary conversation that didn’t happen. I went indoors, and sketched in there instead. I did wonder where Avengers Tower was, since my New York is so bound to the imaginary. Being inside the immensely impressive Grand Central reminded me of that scene in Avengers when Thor and Hulk take out those Chitauri, and then Hulk punches Thor sideways. It also reminded me a lot of the Lego Marvel video game, the bit where you have to fight Sandman. I liked standing in here sketching, and I had intended on adding colour as well, but the day was moving along fast and I wanted to get back and go for dinner. I was told afterwards that there is an amazing place in the downstairs food court for beer and oysters, and I wish I had tried it, but that just gives me an excuse to go back to New York. Hey, do we even need an excuse to go back to New York? It’s an amazing city, with more sketching to be done there than I can possibly imagine (and yeah, punchline coming, I can imagine quite a bit). Great sketch. You’ve captured the throng of activity as well as the architecture. I commend you for being able to hold a pen in the cold. It’s funny you mention the Marvel video game because the first time I took my kids to NYC my then 8 year old could find his way around midtown by virtue of the map in that game. Well this was Marvel Lego in my son’s case and I can’t vouch for its accuracy either but the central area must have been pretty spot on as he led the way from the Empire State Building to Grand Central and then the red steps in Times Square. Ah yes I remember it well. Been to NYC 3 times, each in winter. Glutton for punishment? No, International Print Fair. 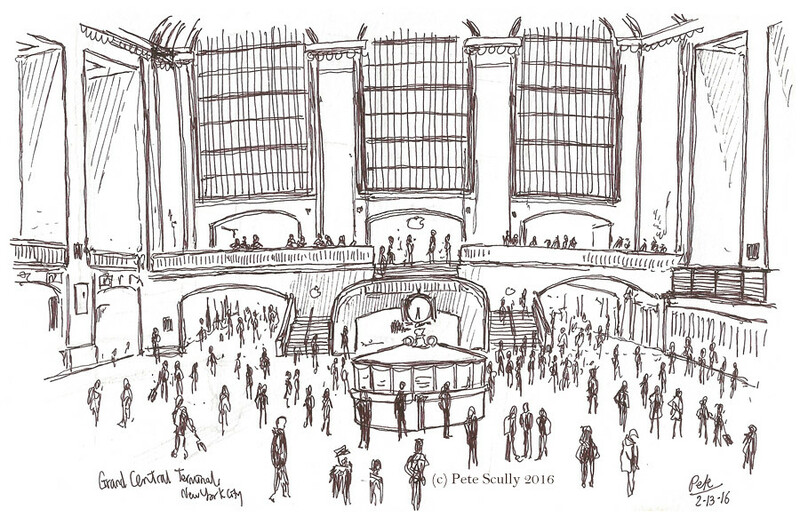 I did a fair bit of sketching and also bolted into Grand Central often. The food court was delightful, a revelation. Love your drawings and thanks for the pen tip – I find Faber Castell Pitt drawing pens work well in the cold too. Absolutely brilliant. 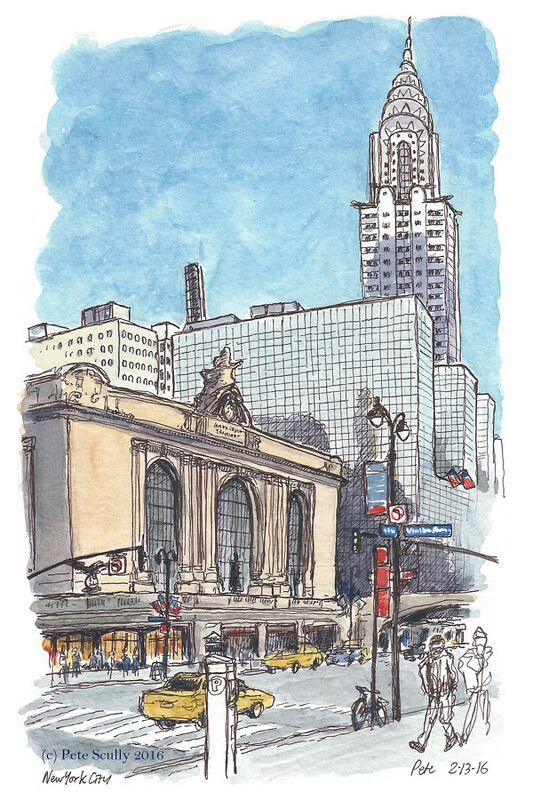 Loved the sketches and the info on NYC. Great sketch. One day I want to be in NYC in winter. 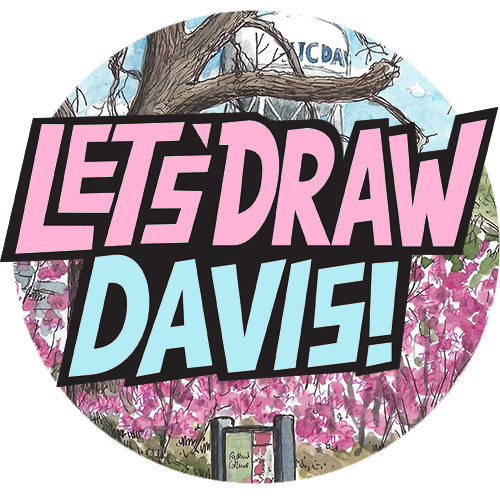 Great sketches and snappy patter. I see you captured my favorite, the Chrysler Building. now, it’s Spingerland in redkit, uber Deutchlund!